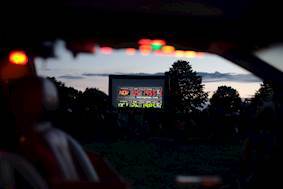 Salvage Cinema is a full service outdoor cinema hire company based in Worcestershire, specialising in outdoor, open air and pop-up screenings. “We are seeing a growth in interest in outdoor cinema which creates an unforgettable immersive experience for the movie-goers." Challenge: Salvage Cinema needed two robust, reliable and bright Full HD projectors that are cost-effective and small enough to set up easily at the outdoor screenings. Solution: With Full HD 1080p resolution and 5,000-lumens, the cinema company chose Optoma’s EH501 projectors due to their brightness, image quality, reliability and flexible throw ratio. 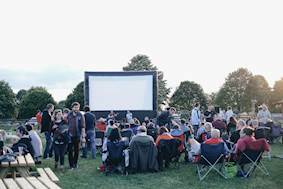 Salvage Cinema was established in 2015 to offer outdoor cinema equipment hire with the team overseeing all elements of the event including planning, risk assessments, marketing, technical set-up as well as the equipment. In addition, it planned to organise its own indoor and outdoor screening events. It needed two robust, reliable and bright Full HD projectors that are cost-effective and small enough to set up easily at the outdoor screenings. With Full HD 1080p resolution and 5,000-lumens, the cinema company chose Optoma’s EH501 projectors due to their brightness, image quality, reliability and flexible throw ratio. The next evolution of the EH501 is the EH504 which offers Full HD image quality and is ideal for large scale installations ranging from conference rooms to large classrooms, lecture theatres, museums and houses of worship, as well as outdoor cinemas! Audio is provided by four powerful Peavey 15’ Pro Speakers and four 18’ Pro Subwoofers via two Kam Pro KXR2000 amplifiers and a Yamaha MG16XU Audio Mixer. Now in its 2nd year, Salvage Cinema has a healthy hire business as well as managing its own regular screenings. This summer Salvage Cinema is growing with more equipment and a new eight-metre wide screen. Mike said: “We are seeing a growth in interest in outdoor cinema which creates an unforgettable immersive experience for the movie-goers. Our screening of Romeo and Juliet on Valentines Day in Birmingham sold out almost immediately and we will shortly announce the dates and locations for our Life’s a Beach programme of movies across the UK throughout the summer. Dates for screenings are listed on Salvage Cinema’s website as well as details for cinema hire. 1x EH501 5,000-lumen Full HD projectors, 4x Peavey 15’ Pro Speakers, 4x 18’ Pro Subwoofers, 2x Kam Pro KXR2000 amplifiers and a Yamaha MG16XU Audio Mixer.